You can use the bond price formula to determine the value of a bond. While it involves some number crunching, it’s a fairly straightforward process because future cash flows to the investor (the bondholder) are always specified ahead of time. The issuer has to meet the interest and principal payments as they come due, or the bonds will go into default – something that can have devastating consequences for the issuer and, in the case of corporate bonds, its shareholders. When you calculate the price of a bond, you are determining the maximum price you would want to pay for the bond, based on how its coupon rate compares to the average rate most investors are currently receiving in the bond market. Due to default risk, investors may require a higher rate of return than the prevailing risk-free rate. In general, the greater the default risk on a given bond issue, the higher the required rate of return. Now that we know the formula, let’s go through an example to find the price of a plain vanilla bond. We’ll assume the bond matures in 10 years, has a par value of $1,000, a coupon rate of 10% and a required yield of 12%. Determine the value for each coupon payment. Since the coupon payments pay semi-annually, we’ll divide the rate in half. 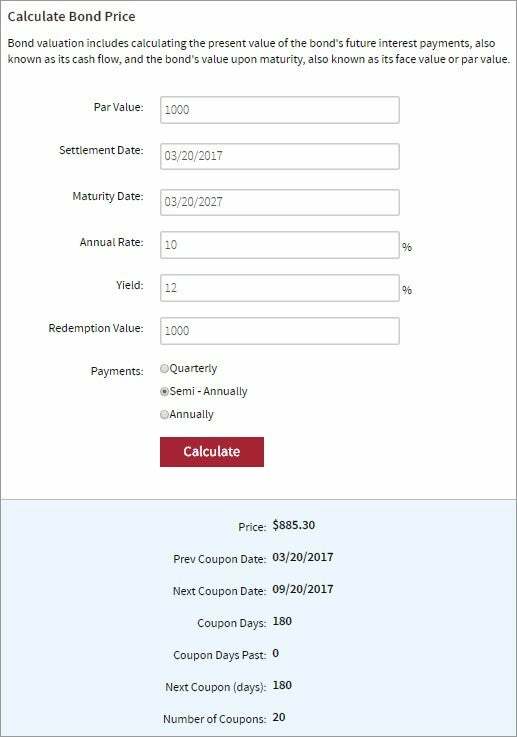 The coupon rate is based on a percentage of the bond’s par value, so each semi-annual coupon payment will be $50 ($1,000 X 0.05). Determine the semi-annual yield. Like the coupon rate, we’ll also need to divide the required yield by two. Our required semi-annual yield would be 6% (0.12/2). 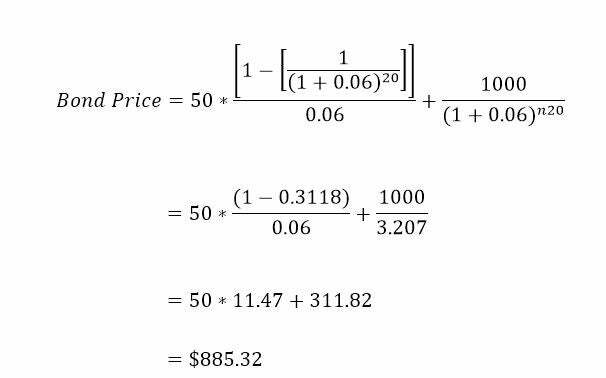 Our math shows that the bond is selling at a discount: The bond price is less than its par value because the required yield is greater than the coupon rate. In order to attract investors, the bond has to sell at a discount. Note: If you don’t want to do the math yourself, you can use online calculators to simplify the process. The following screenshot shows our same bond scenario, calculated using Investopedia’s Bond Price Calculator. With zero-coupon bonds, there isn’t a coupon payment until maturity. As a result, the present value of annuity formula is unnecessary. Instead, you calculate the present value of the par value at maturity. Here’s an example, assuming a zero-coupon bond that matures in five years, with a face value of $1,000 and a required yield of 6%. Determine the number of periods. The required yield of zero-coupon bonds is usually based on a semi-annual coupon payment. We have to adjust the 6% required yield to its equivalent semi-annual coupon rate. As such, the number of periods will be doubled to 10 periods (5 X 2). Determine the yield. We have to divide the 6% yield by two because the number of periods has doubled. The yield for this bond is 3% (.06 / 2). It’s important to note that zero-coupon bonds are always priced at a discount. If they were sold at par, you would have no way to make money from them, and no incentive to buy them. So far, our pricing calculations have assumed that we are buying bonds where the next coupon payment is one payment period away. Since you won’t always buy bonds on their coupon payment dates, it’s worth knowing how to price bonds between payment periods. There’s one more step. We need to know how many days are in the six-month period of the regular payment cycle. In our example, there are 182 days, so the day count of the Treasury bond would be 91/182, which means that out of the 182 in the six-month period, there are 91 days left before the next coupon payment. So our day count convention would be 90/180 (remember, this method assumes each month has 30 days). The fraction of the coupon payment that the bond seller earns for holding the bond between payments is called accrued interest. Since many bonds on the secondary market trade in between coupon payment dates, the bond seller has to be compensated for the portion of the coupon payment it earned for holding the bond since the last payment. This basically gives both the seller and buyer a pro-rated coupon payment for that period. Here’s an example. Assume that you sell a corporate bond on April 1, 2017 with a face value of $1,000 and a 5% coupon paid semi-annually. The next coupon payment is expected on July 1. Since the coupon payments are semi-annual, we’ll divide the coupon rate in half. Each semi-annual coupon payment, then, would be $25 ($1,000 X 0.025). So, in this example, the accrued interest is $12.50. If your buyer pays you what’s called the dirty price (which they normally would), you would receive the $12.50. Note that bonds are priced as clean or dirty, depending on whether accrued interest is included. Most bonds are quoted at clean prices and transacted at dirty prices, which include the accrued interest. Note: If you don’t want to do the math yourself, you can use online calculators to simplify the process, including Investopedia’s Accrued Interest Calculator. To determine the value of a bond today — for a fixed principal (par value) to be repaid in the future — we can use an Excel spreadsheet. Investors base investing decisions and strategies on yield to maturity more so than coupon rates. Understanding this relationship can help an investor in any market. A guide to help to understand the simple math behind fixed-coupon corporate bonds. Use these strategies to counteract the stores' and manufacturers' coupon tactics and come out ahead. Understanding bond prices and yields can help any investor in any market. Learn the basic lingo of bonds to unveil familiar market dynamics and open to the door to becoming a competent bond investor. Any investor, private or institutional, should be aware of the diverse types and calculations of bond yields before an actual investment.